ACP multi-season Randonneur 5000 and Randonneur 10000 Awards via the International Brevet Secretary (brevets@audax.org.au) are due by 31 October, 2018. 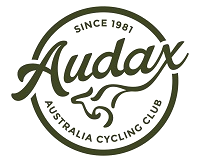 Note this date in you diary for the Grande Audax Queensland Christmas Soiree. Last year was a very enjoyable barefoot bowls session followed by a fine repast in air conditioned comfort. How will we possibly top that this year?? The 2018 Perth Albany Perth has been completed. Congratulations to Brian Hornby, Raoul Dover and Steve Powell who completed the event. This was Brian’s third time round, and a maiden round for Raoul and Steve. Steve finished first – amazing effort for such a distance on the first time out. Commiserations to Gayle Sticher and Jeff Franklin who retired from the event. And who hasn’t faced the unwelcome vista lurking behind a pair of knicks whose use by date has well and truly expired? Thankfully, Mark Harris has researched the issue and found a solution. John McMullan shares his FNQ Six Pack and Six Bumps experiences and Gayle tells us about her Innisfail adventure. There was a podium girl?? I am still traumatised after taking the wrong gears around the hills last year. Andrew Gills had a much better time and relates his 2017 Rollercoaster experience. From Rosewood over the Grandchester Range past Mulgowie and Thornton, then return.